When building scale models, good brushes, paint, and good quality kits are essential for satisfying end results. However, there are many household items that can help you get the desired results and they're inexpensive too. Keeping your work area neat and organized as you work is very important. One area that can be a problem is keeping track of small parts. Losing parts that roll off your work surface or that drop on the rug when you're not looking can be quite frustrating, and although not easy to eliminate entirely, you can minimize the problem. Mint tins are great for storage of parts as they also have a lid and can keep the parts clean as well. You can also use jewelry gift boxes or any shallow box or container. One of the biggest disasters in plastic modeling is spilling a bottle of liquid cement on your parts during or after assembly. This can be avoided by simply making your bottle spill-proof. The cement bottle can be glued to a piece of card stock or wood. Another way is to get a chunk of wood and bore a hole in it to the appropriate size of the bottle. Once your work area is setup with your containers and models, you're ready to dive in. Cleaning mold release and chemicals on your parts can be easily accomplished with simple dish washing liquid and warm water, or better yet with common, rubbing alcohol. The advantage with rubbing alcohol over the dish liquid is that it will remove all finger prints, chemicals, mold release etc. and evaporate quickly! The warm water/dish liquid could expand carefully filled seams. Before spraying primer on your model, give it a quick swipe with a simple tack cloth to remove any unseen dust particles. I have found both cotton swabs and toothpicks to be two of the most useful modeling tools. Especially toothpicks! They are not only great for applying glue, but also for smoothing filler and for many aspects of sculpting on figure models. And speaking of sculpting, a piece of glass from a discarded picture frame and some talc (baby powder) is very useful when rolling out two-part epoxy putty to keep it from sticking to the glass. 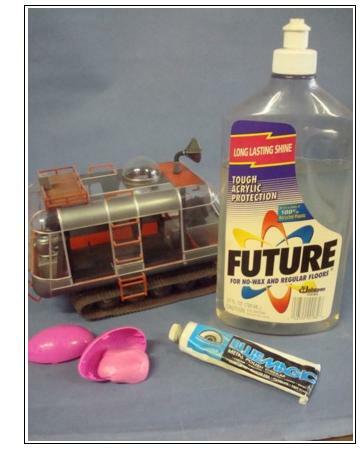 On clear plastic, such as canopies on aircraft models, spacecraft with domes, or any fragile clear piece that could be subjected to cracking during polishing, a piece of Silly Putty inside can help to support/reinforce the piece during sanding/polishing. After the clear part is polished, finish it with a coat of Future Floor Wax, the piece can be dipped, or airbrushed. The nice thing about Future is that it is perfectly thinned for airbrushing. Simply put it directly in the paint cup and airbrush it on. Future is also great for pre-decaling a model, after which you can apply another coat of Future or a matte varnish depending what finish you want. Another very useful household item in modeling is white glue. It's great for clear canopies, and stubborn decals. On clear parts like windshields, canopies and other similar items, white glue won't craze the parts like Super Glue, and it dries completely clear! It also works great as filler around the seam of the canopy. On decals, sometimes on older kits the aged decals may not want to lay down properly, a little white glue (slightly diluted with water) can help. Afterwards the decal can be sealed with varnish or Future Floor Wax (as mentioned above). 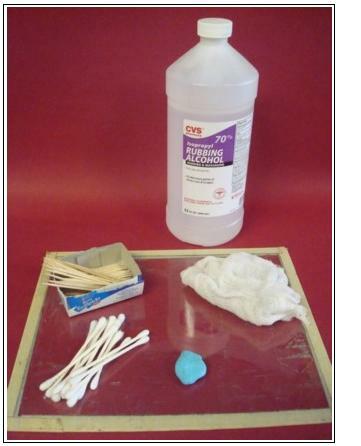 White glue is also great for use on groundwork on a diorama. 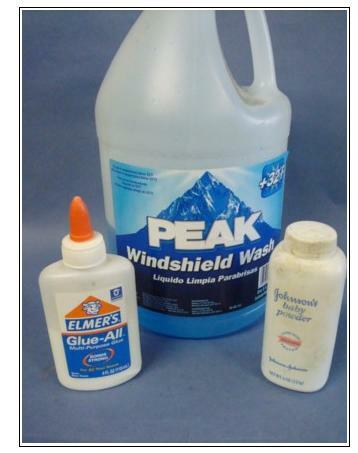 For applying grass, leaves, and small stones and rocks, this glue is great. Again, the other advantage is that it dries clear. Blu-Tack or earthquake putty, is a reusable one-part putty that's extremely useful in modeling; it's not only great for transporting models safely to competitions and exhibitions, (I've never had a problem with damage of a model since I started to use Blu-Tack for transporting) it has several other uses as well. On figures, you can easily mask a face or hands with this putty and remove it without worrying about residual chemicals or oils from the putty. It conforms easily to a compound surface, and can be reused. It's also great during the building of a scale model or figure for holding various parts temporarily together while fitting or mocking it up before gluing. In closing, I would like to add that the household items mentioned are not necessarily limited to tools and materials, but that many other items around the house could also be useful for your model as well, but that's something that could be covered in another article. In the meantime, experiment, and make use of what's around your house, you may be surprised!